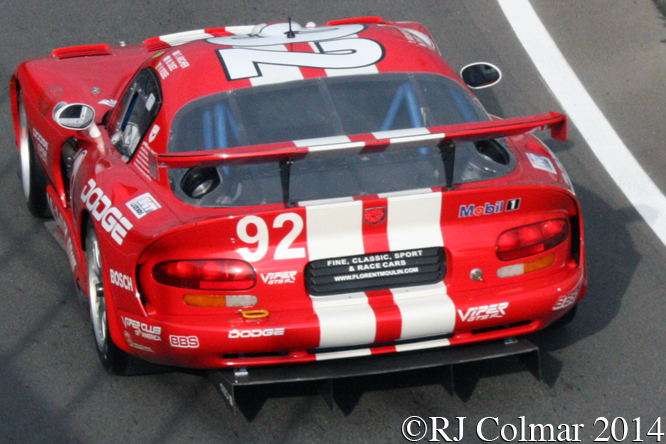 In order to promote it’s new for 1995 Dodge Viper GTS Coupé and compete in the plethora of GT Championships across the globe in the late 1990’s Chrysler sanctioned the construction of GTS-R race variant to be overseen and maintained by the French Race and Engineering team Oreca. The bare chassis for the Oreca built GTS-R’s were fabricated by the British company Reynard who had a long established reputation for building open wheelers from Formula Ford all the way up to Indycars. There reputation was enhanced by the fact that every time they entered a new formula they won first time out. 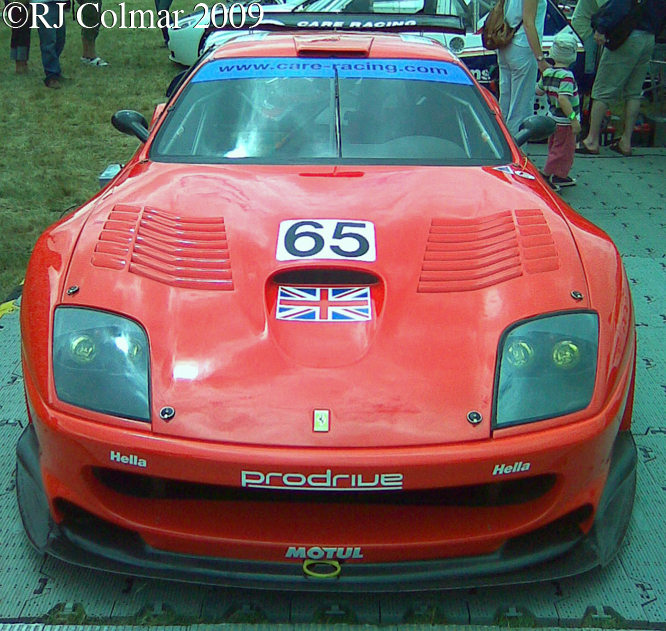 The 8 litre / 488 cui V10 motors were lightly modified to improve output and reliability, in all 5 prototypes and a further 52 Chrylser Viper GTS-R’s were built between 1996 and 2005. 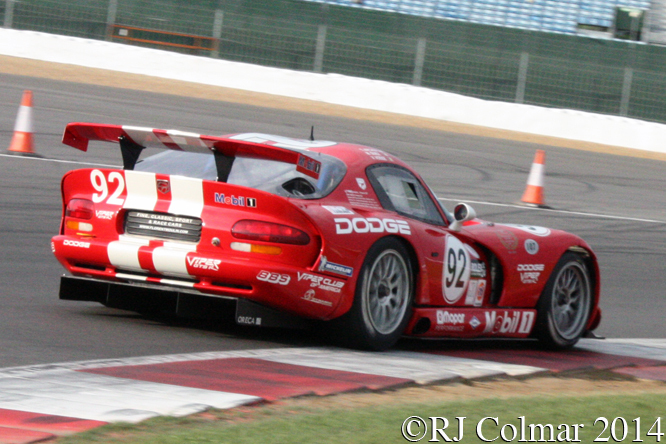 In the USA the cars were run as Dodge Vipers while in Europe where the Dodge brand did not have any official market presence the cars were run as Chrysler Vipers, with the exception being at the 2007 Nurburgring 24 Hour race where ’99,’01 and ’02 winners Zakspeed entered their Viper, which finished second, as a Dodge to mark the arrival of the Dodge brand in Europe. Today’s featured car chassis #C30, seen at Silverstone in the hands of Classic car dealer Florent Moulin, appears to have been built in for the 2000 season and raced by Viper Team Oreca in the US, as a Dodge and Europe, as a Chrysler, by Jean-Philippe Belloc, Anthony Beltoise, Ni Amorim, Tommy Archer, David Donohue, Marc Duez, Patrick Huisman and Boris Derichebourg. 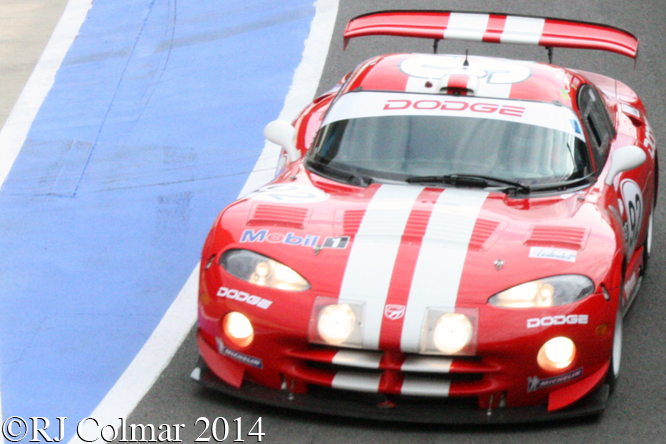 #C30’s best result was in the 2000 Grand Prix of Sanoma where Tommy Archer and David Donohue recorded a class win and 8th overall in the Dodge branded racer. 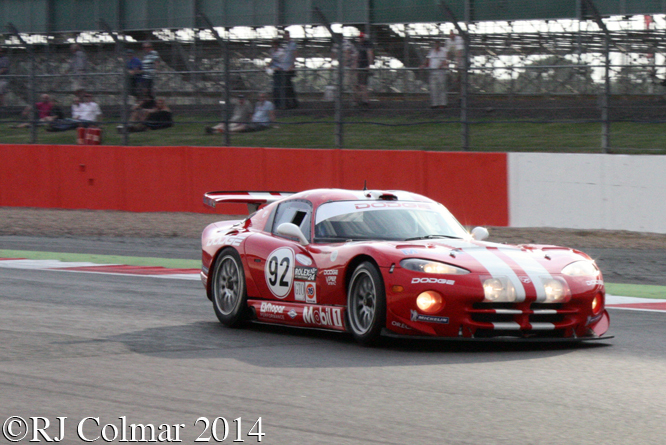 This entry was posted in Uncategorized and tagged Amorim, Archer, Belloc, Beltoise, Chrysler, Colmar, David, Derichebourg, Dodge, Duez, GT Legends, GTS-R, Huisman, Moulin, Oreca, Psychoontyres, Ralph, Reynard, Silverstone Classic, Viper, Zakspeed on October 16, 2014 by Ralph. The 200 mph front engine rear gearbox 550 Maranello road model was introduced in 1996 with a 485 hp 5474 cc / 334 cui 4 valve quad cam V12 motor that could take the GT car from zero to 62 mph in 4.5 secs. 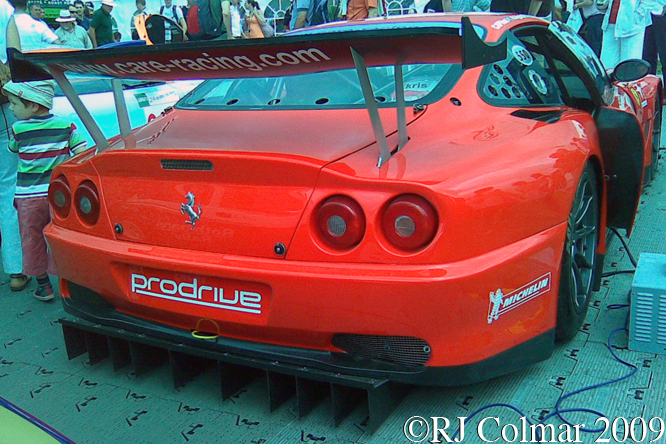 Prodrive prepared a batch of 20 550 Maranello GTS’s for racing in Europe and the States where they were regular winners in the GT/GTS class in 2001. 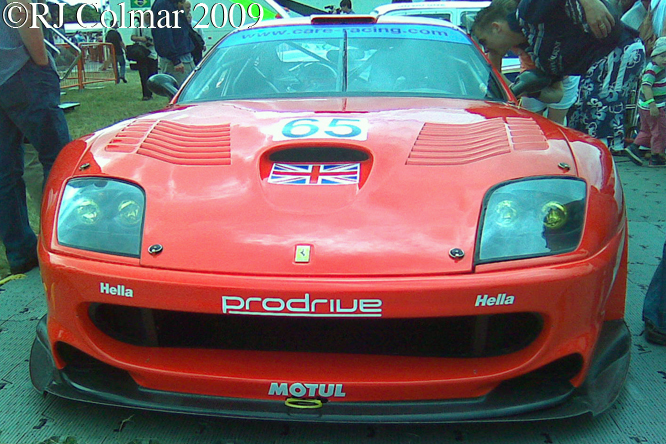 In 2003 another Prodrive 550 Maranello GTS beat the Corvettes by 10 laps at the Le Mans 24 hour race coming home 10th overall. This chassis has taken part in at least 42 Races in the GT/GTS class for at least four different teams from 2002 to 2006 it has never recorded an out right win but has scored several class wins. 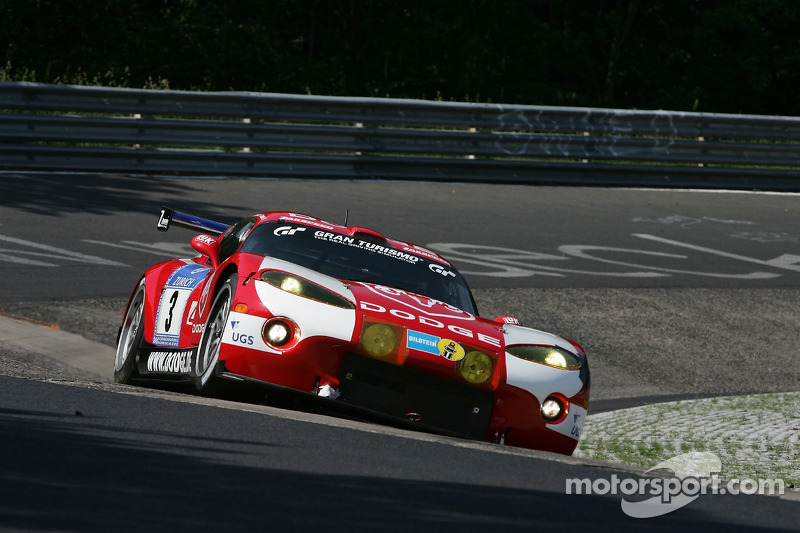 In 2004 this chassis (Prodrive 03) driven by Darren Turner, Rickard Rydell and Colin McRae came in 9th overall at Le Mans but was beaten by two Corvettes which finished 16 and 5 laps ahead respectively. 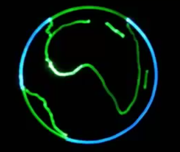 Today’s featured Celebrity Car has been driven by a number of well known drivers including Colin McRae former World Rally Champion, Rickard Rydell former British Touring Car Champion, Alain Menu former British Touring Car Champion, Luc Alphand former World Cup Skiing Champion and Dakar winner, David Brabham, former Japanese GT Champion and Le Mans winner 2009, Jan Magnussen, former Danish Touring Car Champion, Danica Patrick queen of IRL and NASCAR, Darren Manning IRL driver, Christophe Bouchut 1993 Le Mans Winner, and one of my former racing instructors Tim Sugden former British and Asia Pacific GT Champion. Thanks for joining me on today’s “Celebrity Car” edition of “Gettin’ a li’l psycho on tyres”, I hope you will join me again tomorrow, when I’ll be looking at a Formula One Lotus. Don’t forget to come back now ! This entry was posted in Uncategorized and tagged 550, Alain, Alphand, Bouchut, Brabham, Car, Chevrolet, Christophe, Colin, Colmar, Danica, Darren, David, Ferrari, Festival, GALPOT, Goodwood, GTS, Jan, Le Mans, Luc, Magnussen, Manning, Maranello, McRae, Menu, Patrick, Prodrive, Racing, Ralph, Rickard, Rydell, Speed, Sugden, Tim, Turner on December 28, 2012 by Ralph. Anyone one heading east along the A412 Uxbridge Road in to Rickmansworth would be forgiven for missing Fairway Tyres located in a building set back from the road with a forecourt. It turns out this building is called Tornado House recalling Tornado Cars Ltd which once employed up to sixty people to manufacture around 600 sports cars from 1957 to 1964 that were marked under the Typhoon, Tempest, Thunderbolt and Talisman names. Tornado went into liquidation in 1964 it would appear just after the introduction of a hot GT version of the FIAT 600D known as the Tornado FIAT 600D GT. 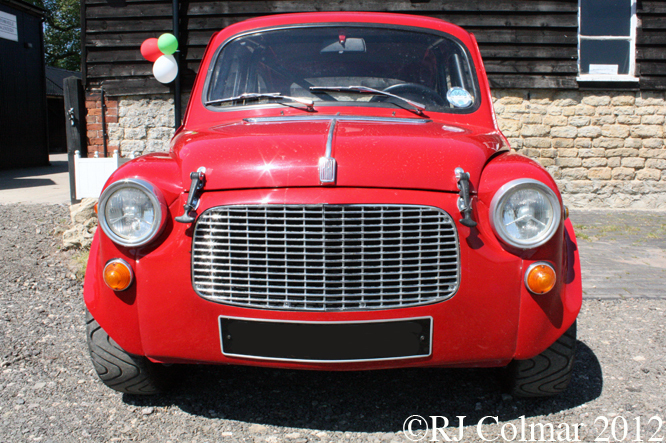 Around two and a half million FIAT (Seicento) 600D’s were manufactured between 1955 and 1969, powered by a water cooled straight 4 cylinder motor giving either 21 hp or 29 hp according to size, which lent itself to easy tuning with upgrades available from the likes of Carl Abarth. 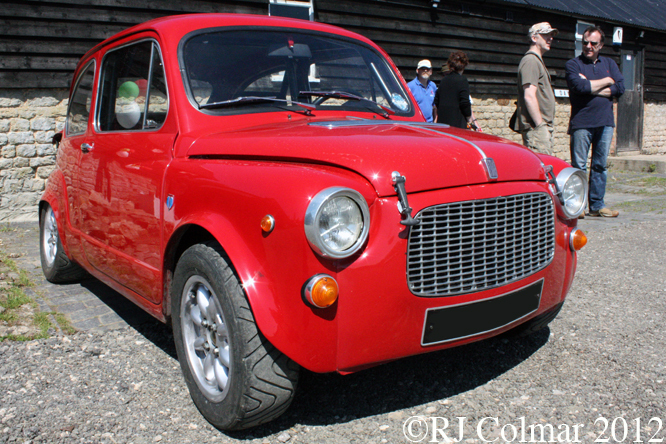 The FIAT 600D, which sold for 590,000 lire new was also manufactured in Barcelona, Spain where it was marketed as the SEAT ( pronounced c @ ) 600, Kragujevac, in what is now Serbia where it was marketed as the Zastava 750. 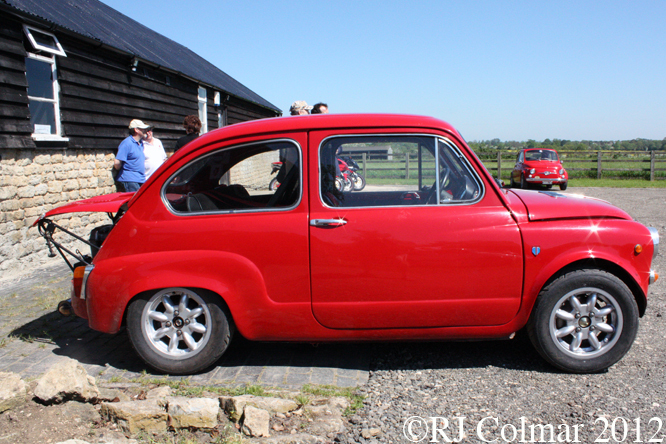 As of 2011 it was thought only 65 road legal Seicento’s remain in the UK. 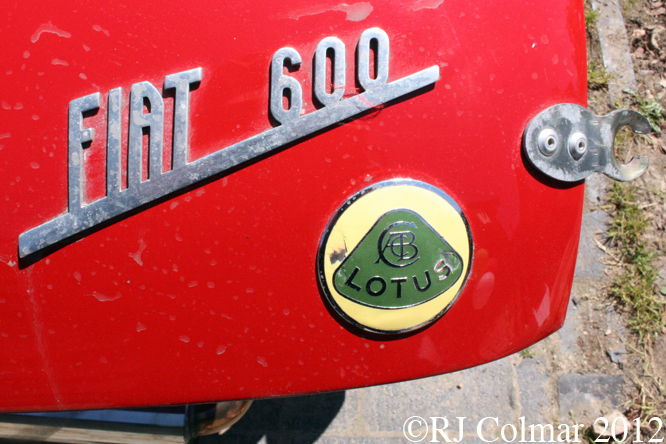 One of the Tornado FIAT 600D GT’s was acquired by David Render in 1965, readers, of the Lotus 76 and Lotus 77 posts, may remember that David was friends with Colin Chapman of Lotus Cars who suggested and arranged for Davids Tornado FIAT 600D to be fitted …. 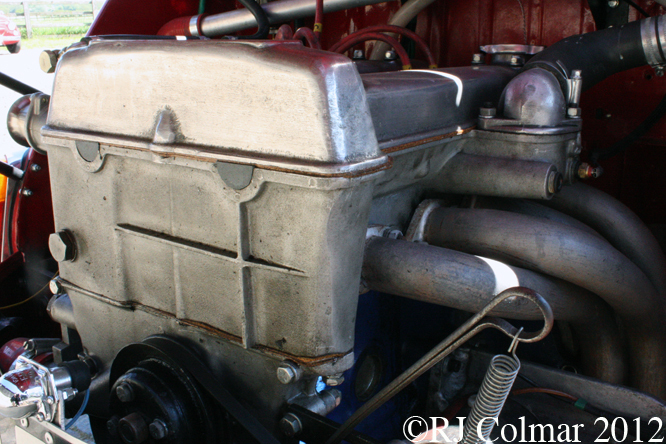 … with a full blown Lotus Twin Cam motor normally found in the Lotus Cortina and Lotus Elan. with which he estimates he won over 50 trophies in the period he owned it. 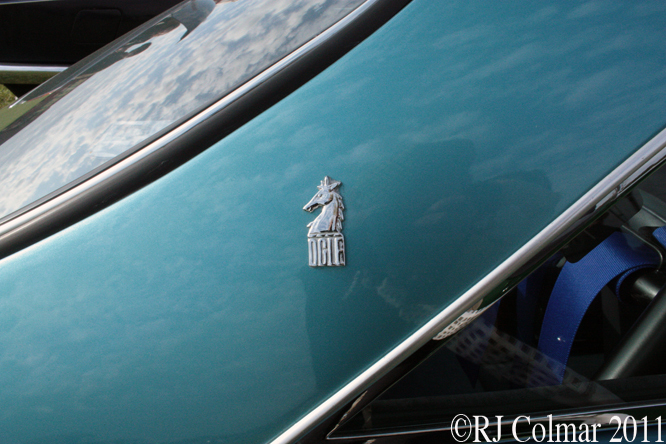 David’s car is seen here at the recent Middle Barton Garages silver jubilee celebration. 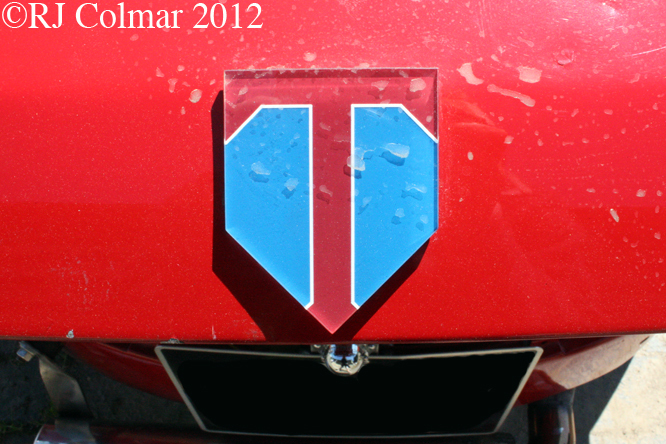 Please note Tornado Cars Ltd of Rickmansworth is not to be confused with Tornado Sports Cars of Kidderminster. 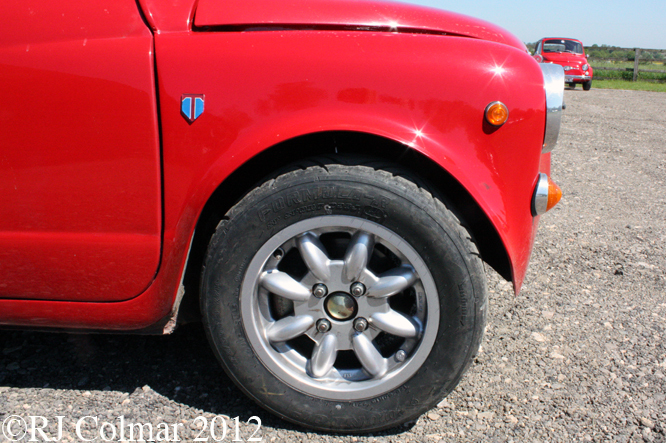 Thanks for joining me on this “Stunning Seicento” edition of “Gettin’ a li’l psycho on tyres”. I hope you will join me for Americana Thursday tomorrow. 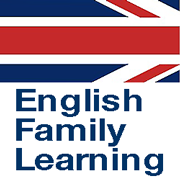 Don’t forget to come back now ! 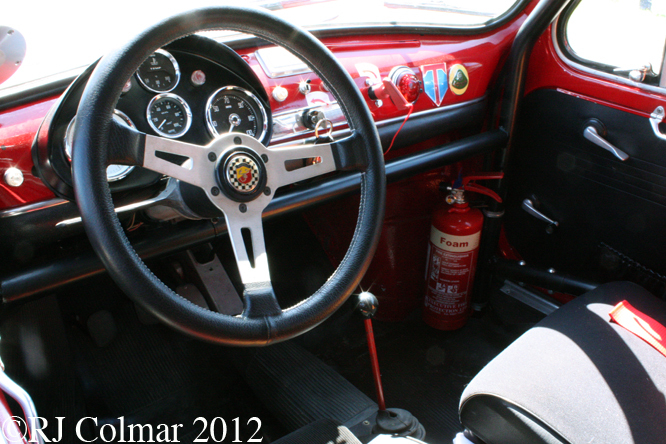 This entry was posted in Uncategorized and tagged 600D, Barton, Chapman, Colin, Colmar, David, Fairway, Fiat, GALPOT, Garage, GT, Lotus, Middle, Ralph, Render, Rickmansworth, TC, Tornado, Tyres on June 27, 2012 by Ralph. 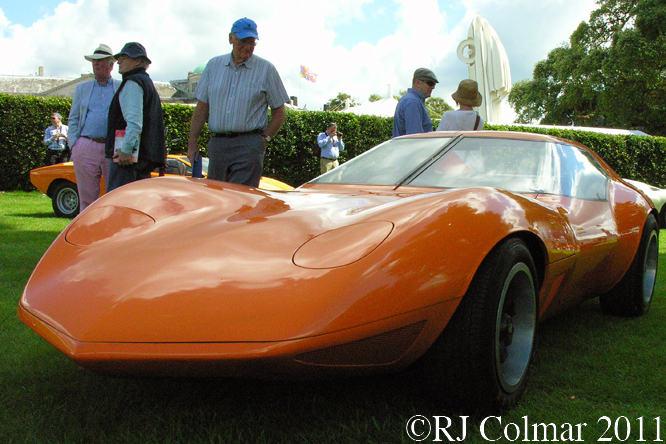 The Vauxhall XVR, seen here at Goodwood Festival of Speed, was the first Concept Car ever exhibited by Vauxhall Motors, it appeared in public at the Geneva motor show in 1966. 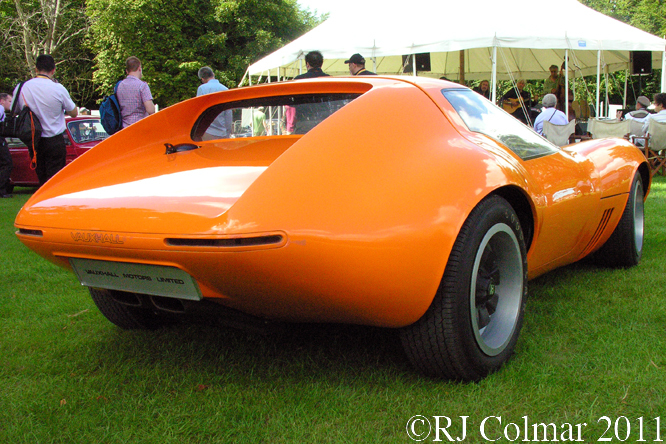 Wayne Cherry who had been involved in the design of the Chevrolet Camaro / Pontiac Firebird and Oldsmobile Tornado was transferred from GM central in Detroit to GMs English manufacturer Vauxhall Motors in 1965 and with is credited with the Stingrayesque styling of the XVR alongside the Director of Styling David Jones. 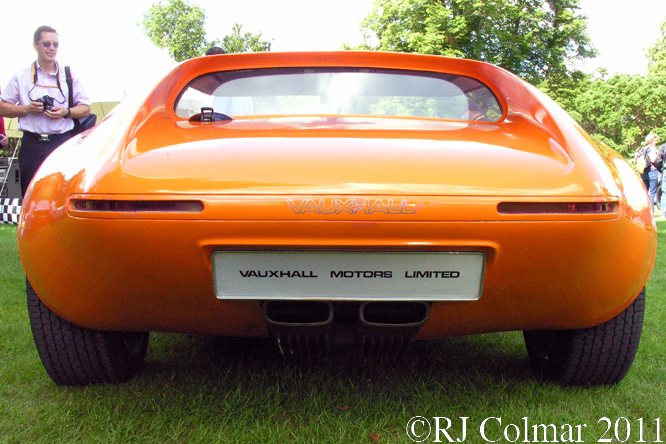 3 XVR models were built powered by 71 hp twin carburetor 1594 cc / 97 cui 4 cylinder motors as used in the performance VX 4/90 variation on the Vauxhall 101. The XVR was built on a custom built chassis with independent suspension and disc brakes all round. Gull wing doors were part of the futuristic XVR package, even though they had already been seen on the production Mercedes 300 SL dating back to 1954, though unlike the Mercedes the doors on the XVR also form the unusual for the period split windscreen. It is not known why Vauxhall halted production of the XVR concept which is known to have been put through trials at Vauxhall’s Research and Test center after it’s public debut in Geneva. 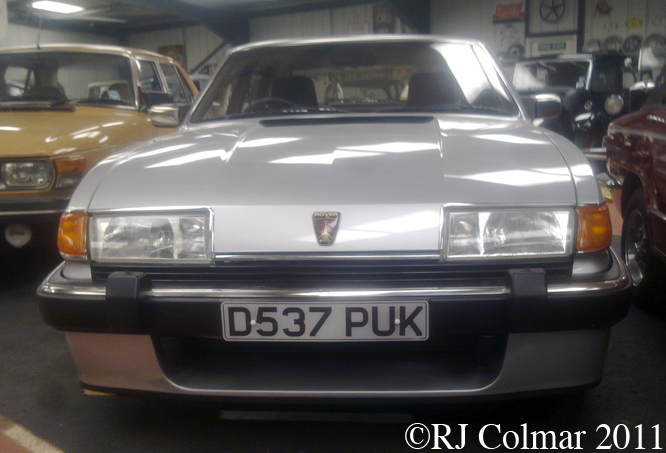 Elements of the concept are said to have found their way into the design of the Vauxhall Firenza including the styling of the dashboard and tail lights. 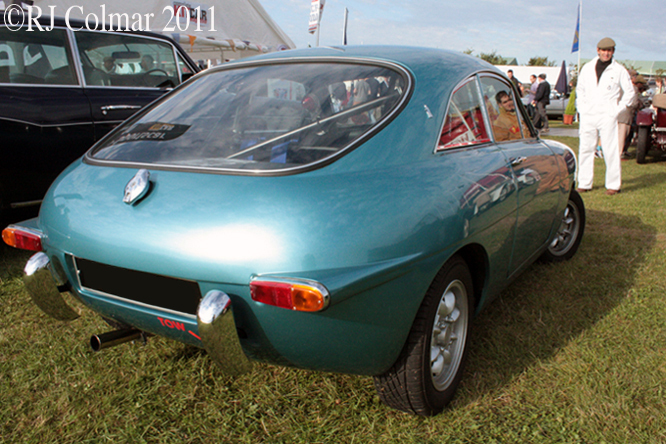 Although as we shall see next week the German chapter of GM, Opel, would build a car that took it’s styling from it’s own Opel Experimental GT concept dating from 1965 it would take another 34 years before the Vauxhall brand name would appear on a two seat sports car namely the Vauxhall VX220. Thanks for joining me on this XVR edition of ‘Gettin’ a li’l psycho on tyres’, I hope you will join me again tomorrow. Don’t forget to come back now ! 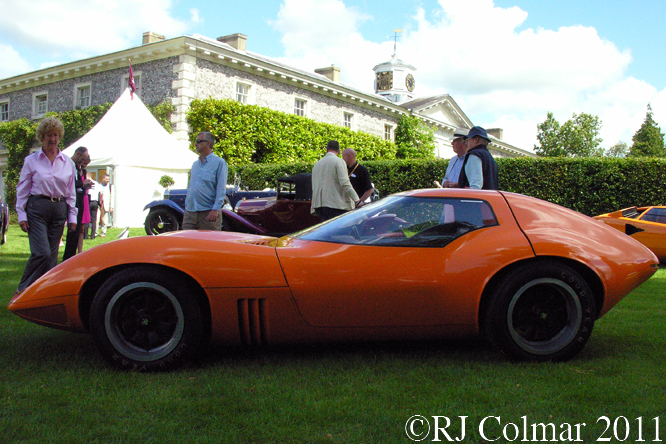 This entry was posted in Uncategorized and tagged Cherry, Colmar, David, Festival of Speed, GALPOT, Goodwood, Jones, Ralph, Vauxhall, Wayne, XVR on November 29, 2011 by Ralph. After serving as a decorated and honoured Supermarine Seafire pilot in the Second World War David Ogle DSC MBE attended the Central School of Art to study Industrial Design. On completion of his studies he worked for Murphy Radio and later Bush Radio where he was credited with the design of the TR82 transistor radio. In 1954 David founded his own industrial design studio which has been credited with the design of all manor of wheeled transport from Chopper Bicycles (1970), through the Reliant Scimitar, to award wining truck cabs for Leyland Road Train vehicles. 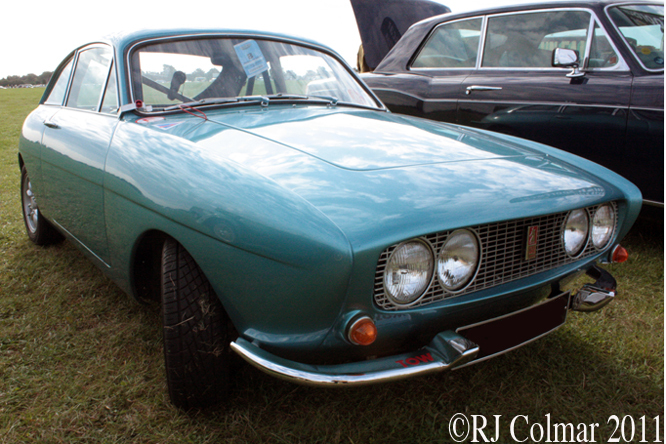 In 1959 Ogle design started building the first of three series of glass fibre bodied cars the 1.5 built on a Riley Chassis with a BMC (British Motor Corporation) motor of which eight were built. 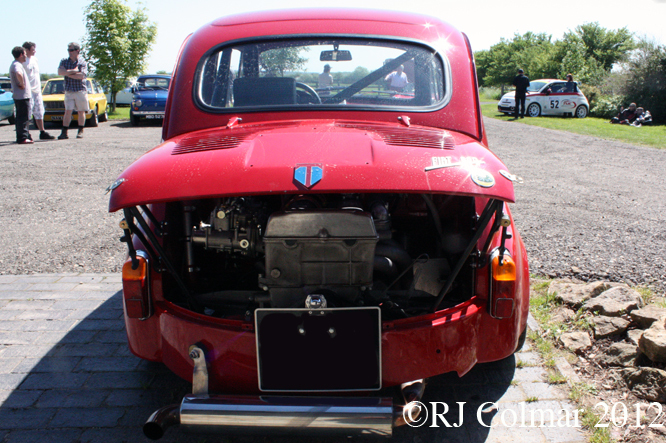 In 1962 Ogle launched the SX1000, as seen here at Goodwood, initially a conversion built around a customer supplied Mini and later built around Ogle acquired Mini’s. 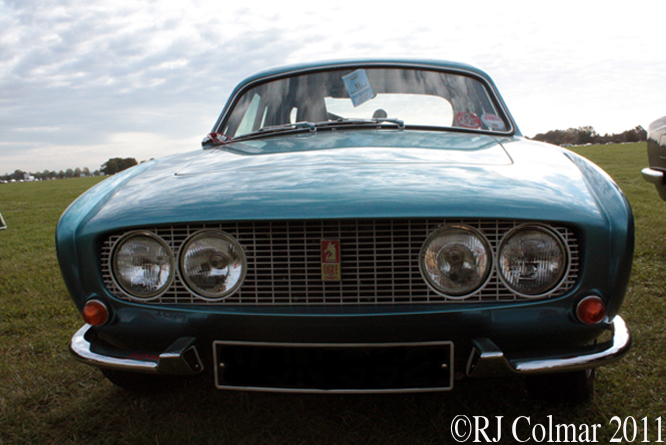 It is thought 66 of these vehicles were built with the last one leaving the factory in 1964. The slippery Coupé was capable of 110 mph when fitted with a top of the range Mini Cooper S engine. 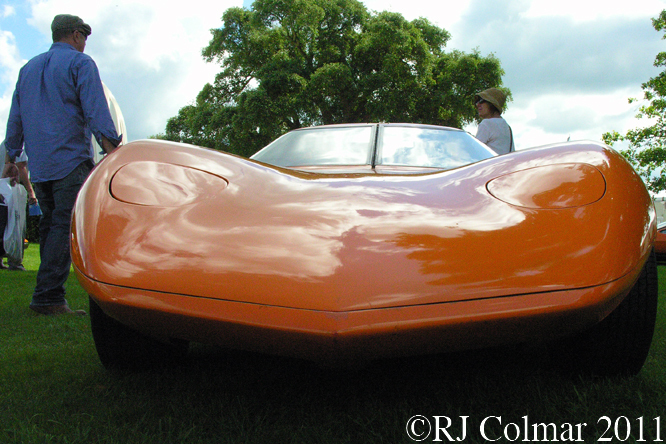 After David Ogle died driving an SX1000 on the way to Brands Hatch and car production at Ogle had been wound up the SX1000 body moulds were sold to a boat builder in the Midlands who exhibited his self named Fletcher GT at the Racing Car Show in 1967. Today with only 26 of the original SX1000’s thought to have survived Nostalgia Cars in Taunton Somerset produce identical replica SX1275 models as kits for Mini enthusiasts. Thanks for joining me on todays SX1000 edition of ‘Gettin a li’l psycho on tyres’ I hope you will join me again tomorrow. Don’t forget to come back now ! 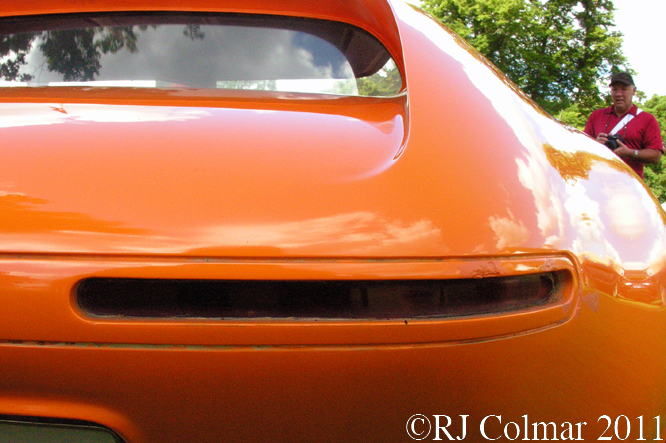 This entry was posted in Uncategorized and tagged Art, Bush, Cars, Coupé, David, DSC, Fletcher, GALPOT, MBE, Mini, Murphy, Nostalgia, Ogle, SX1000, Tidesco on October 9, 2011 by Ralph. There were not many four door executive vehicles that would look comfortable parked along side a Ferrari or Maserati in the 1970’s but the Rover SD1 powered by the familiar alloy Buick derived V8 and designed by David Bache is certainly one that could keep such company in any car park and not look out of place. Thanks in part to a painfully slow process of rationalisation that was occurring at British Leyland during the early 1970’s involving many duplicitous departments and management within the nationalised organisation it took 54 months for the SD1 to move from drawing board to production. 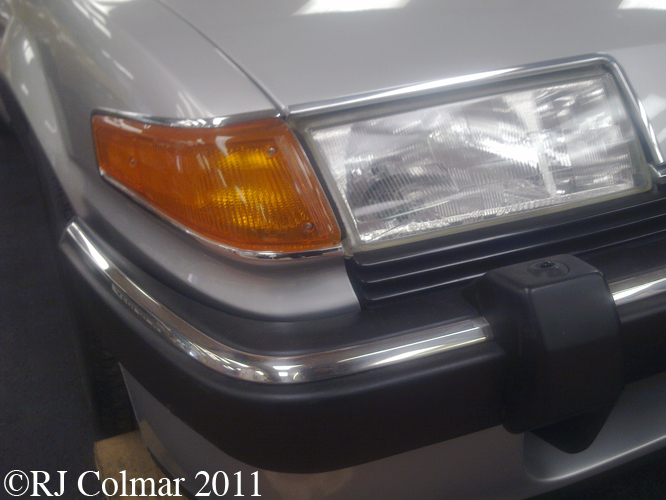 David Bache was not in the least shy about his design influences incorporated into the SD1 including these indicator lights which are almost identical to those found on a Ferrari Daytona. 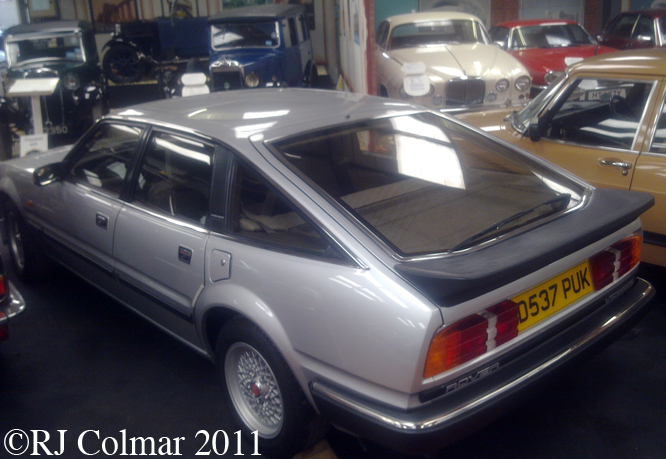 Built in a new purpose built £31 million factory in Solihull the SD1 was marketed as the Rover 3500 and launched in July 1976 to an ecstatic reception regarding the styling and performance, though the quality of some of the materials used and build were short of the market leaders particularly the emerging BMW brand. 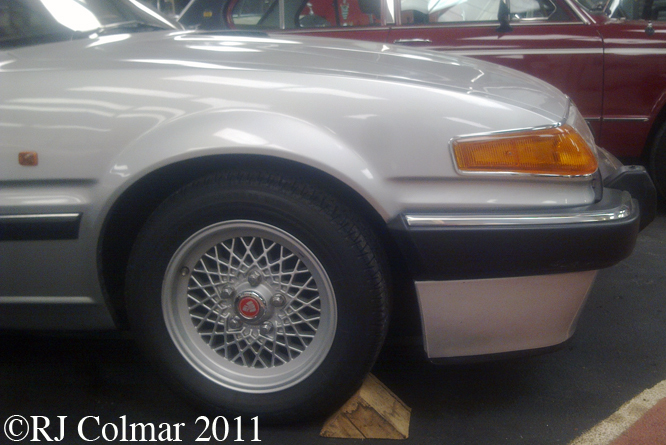 The deep front spoiler and BBS pattern wheels on this model signifies a later model in this case built in 1986. 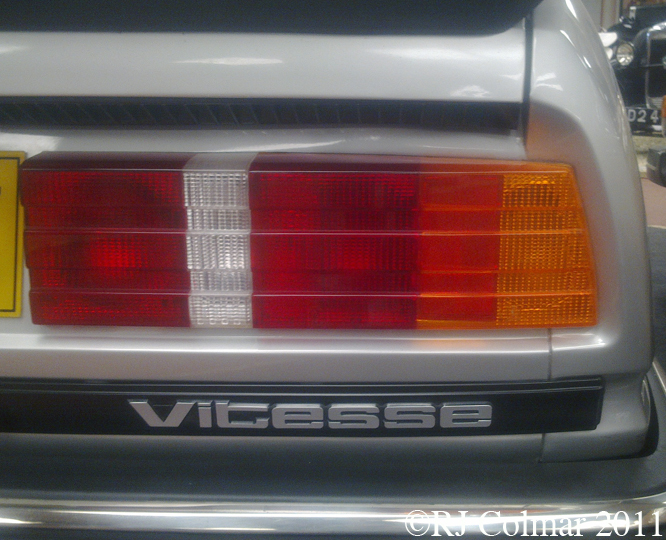 The Vitesse badge hitherto associated with Triumph models belies the fact that the SD1 had technical and marketing input from the still separate and competing Triumph design and management offices. 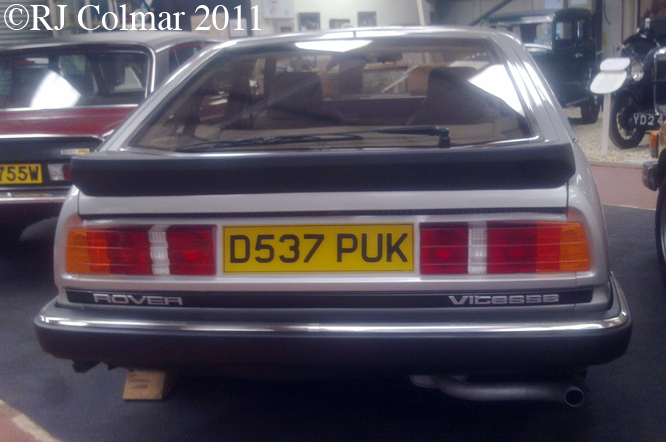 In late 1980 the Rover Vitesse, seen here at the Atwell Wilson Motor Museum, was introduced as the performance version of the Rover 3500 and the Vanden Plas the Luxury version that included leather seats. 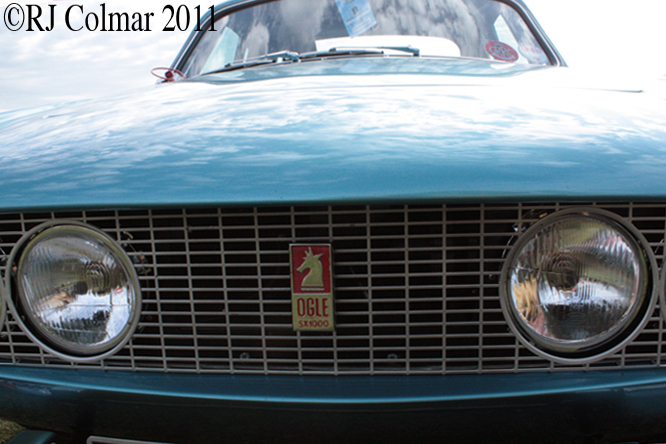 While the styling of the SD1 was ahead of it’s time the rear suspension was actually a technological step back from the de Dion suspension used on the previous Rover P6 to a live rear axle, though this made the cars easier and cheaper to build the move did not compromise the handling, much praised in the contemporary press, in anyway. Since British Leyland had so many competing brands in its range the 1977 European Car of the Year award winner was not the money spinner that it should have been because it was priced so as not to compete directly with the Jaguar XJ6 against which it was seen in an extremely favourable light. Thanks for joining me on the 1977 European Car of the Year edition of ‘Gettin’ a lil psycho on tyres’, I hope you’ll join me again tomorrow when I’ll be looking at a fully loaded turbocharged competitor of the Rover SD1. Don’t forget to come back now ! 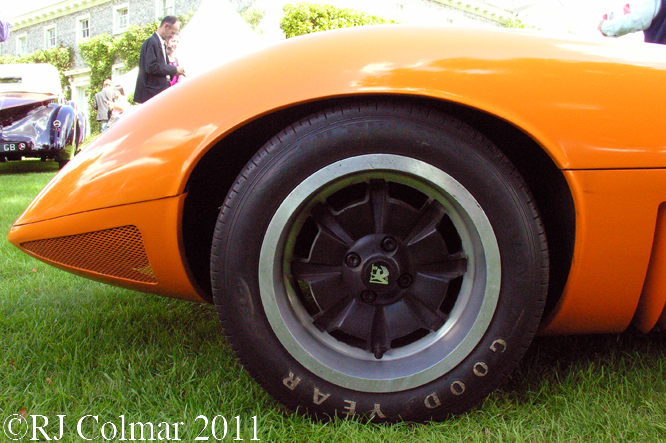 This entry was posted in Uncategorized and tagged 3500, Art, Atwell, Blache, British, Buick, David, Daytona, ECotY, Ferrari, GALPOT, Leyland, Rover, SD1, Tidesco, Triumph, V8, Vitesse, Wilson on September 13, 2011 by psychoontyres. Towards the end of 1963 former British Rally Champion and Racing Driver John Sprinzel joined forces with noted engineer and Morgan racer Chris Lawrence, under the Sprintzel Lawrence Racing (SLR) banner, to design and build a sports car based on a Triumph TR4 powered ladder frame Morgan +4, with a similar chassis to the one that Chris had co driven with Richard Shepherd – Barron to a class victory at Le Mans in 1962. From what I can gather Triumph racer John Hurrell managed to secure some funding for the SLR team and after seeing Chris Spenders drawings for the proposed Williams and Pritchard built bodywork for the Morgan & Triumph SLR car John asked if a similar SLR body could be fitted to his Triumph TR4 that he had been racing since 1960. As things worked out the Triumph with a slightly shorter chassis was the first to be taken to Williams and Pritchard to have an aluminium SLR body built around it. 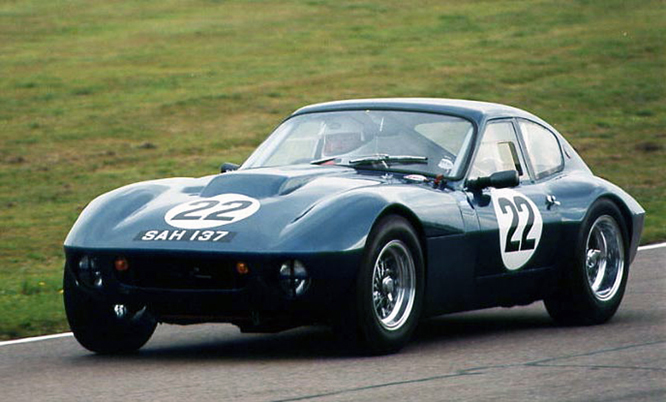 Neil Dangerfield is known to have been winning races in this car as late as 1967 and the Triumph SLR went down in the record books as being the last to leave the start line at Goodwood as the scratch entry in the last, handicap, race held at the Circuit before it closed in 1966. 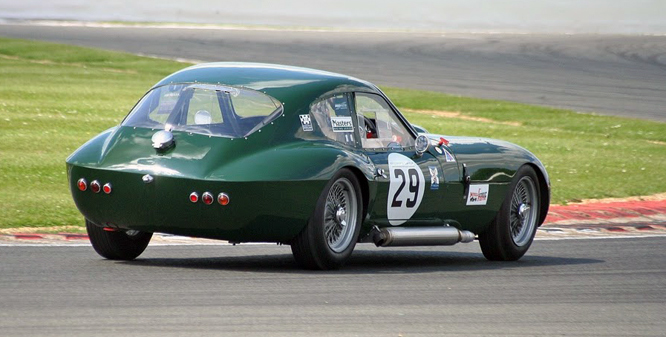 Neil drove the Triumph SLR 31 years later at the request of Lord March on a 3 lap demonstration when the Goodwood circuit was reopened in 2006. 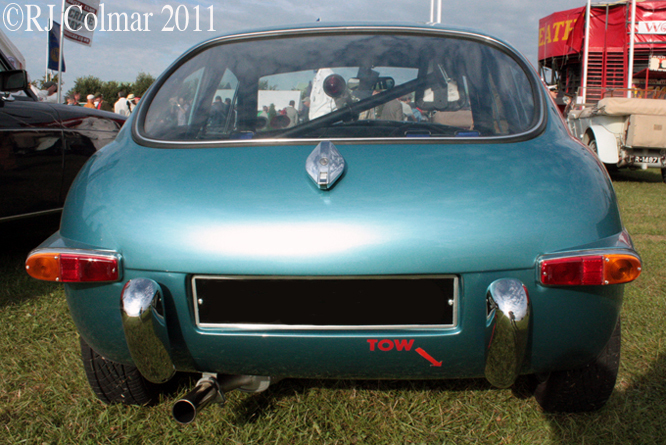 Note the registration SAH 137 was originally issued to a Triumph TR3A owned by Jim Hurrell who transferred the number to the Triumph TR4 that was fitted with the SLR body and later sold it to Neil. The first of the Morgan SLR’s powered by a Triumph TR4 engine and featuring beefed up hubs along with the benefits of other lessons learned from Chris Lawrence’s Le Mans experience appears to have been built around a 1961 chassis for Gordon Spice a well known figure in British racing circles who eventually built and ran his own Spice Group C cars in the late 1980’s. After just 3 laps of Goodwood Gordon crashed his new car in 1964, necessitating a complete rebuild making this red car both the first and last of the Morgan chassied SLR’s built. 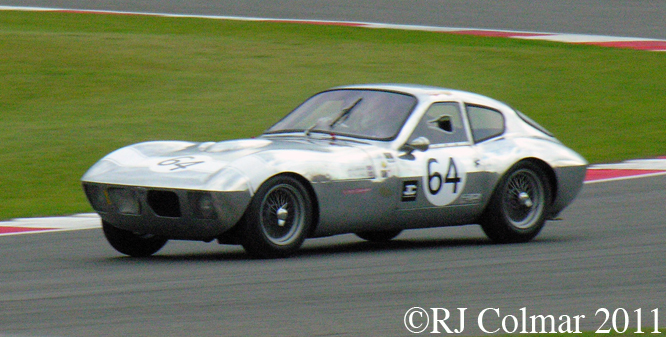 In 1975 then owner Sir Aubery Brocklebank suffered burns after a fuel leak in this car caught fire at Silverstone. The car was subsequently painted fire engine red. The second Morgan and Triumph SLR was built for Pip Arnold, legend has it that this car was never painted because soon after delivery it was due to be raced at Spa and so the aluminium bodywork was merely polished. In the early seventies this car was caught in a severe garage fire and rebuilt by well known fabricator of racing cars Maurice Gnomm. 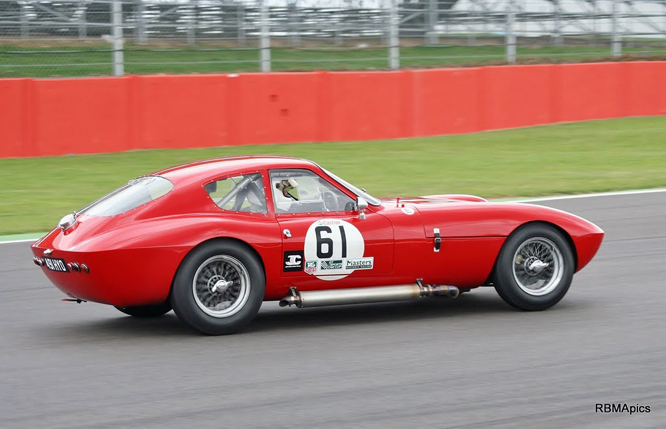 The third car was built for Chris Lawrence himself and set an all time class lap record at the very last race meeting held at Goodwood in 1966. 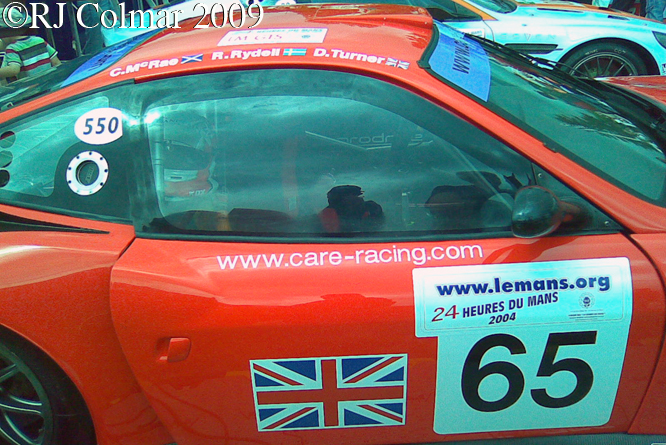 Chris Lawrences old car also won a race during the Goodwood Revival in 2006. From The Nostalgia Forum I’d like to thank David Lawson and Bob ‘Bauble’ Bull for the use of their photographs, Pete Stowe, Kurt O and Sharman for responding to my TNF Triumph SLR thread garyfrogeye for contacting John Sprinzel and Tim of the Willliams and Pritchard website for their kind replies. Thanks also to Andy Downes and in particular Neil Dangerfield of the tr- register forum for his post on the order in which the cars were built to Richard ‘redmorgan’ Gilbert for the use of his photo, John “sprinty” and Steve N22MOG L and everyone at Talk Morgan who responded to my post. Thanks for joining me on this SLR edition of ‘Gettin’ a lil’ psycho on tyres’ I hope you will join me again tomorrow for a look at an exotic Italian that needs a cool pagoda airbox to cover a big block V8. Don’t forget to come back now ! 11 11 11 Post Script John Sprinzel has kindly in formed me that the three Morgan SLR’s first had a reunion at Goodwood several years ago. 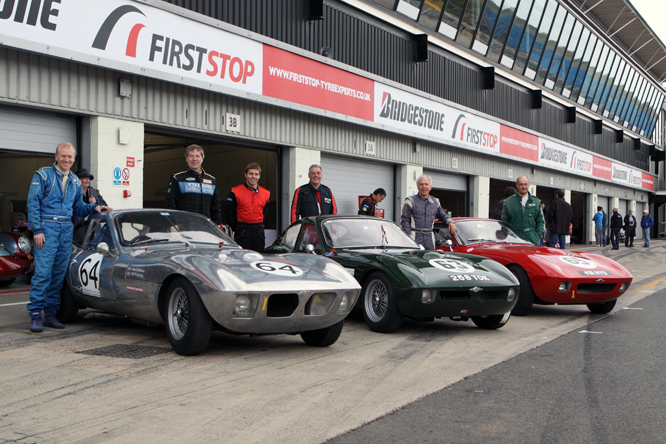 This entry was posted in Uncategorized and tagged Art, Bob, Bull, Chris, David, GALPOT, Gilbert, John, Lawrence, Lawson, Morgan, Richard, SLR, Sprinzel, Tidesco, Triumph on August 6, 2011 by psychoontyres.